As we all look forward to the coming year, I thought it would be fun to look back and see what posts you liked best. I've learned so much this year. One lesson that stands out is to make sure the comment button works when running a contest. I will try to absorb these lessons and put them to good use in 2018. Thank you! Contest and Give Away--Final Hint! May 8, 2017, so many were excited about the contest and give away. It would have been more successfull if the comment button worked so you could have had a chance to win. The tricky thing about the comment button is, no one can contact you to tell you it's not working. Crazy! My sweet Joe fixed the problem, so let's try again. Fortunately, that little technical problem has been squared away. I'm planning on trying a contest again in the coming year. I wish you all the best of luck! Every Cat has Her Night October 28, 2017, you might has heard that Rumer, a large, dramatic silly black cat lives at our house. She is an expert at waking us up when it's time to eat. She doesn't let little things like time deter her. This holiday season she has been busily hiding Christmas tree ornaments throughout the house for us to find, and most importantly she growls at anyone who rings the dood bell. Poor UPS drivers! So of course she deserves an entire post dedicated to just her. 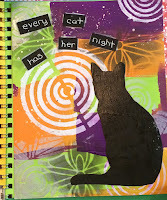 To find our more about her art journal page, click here. 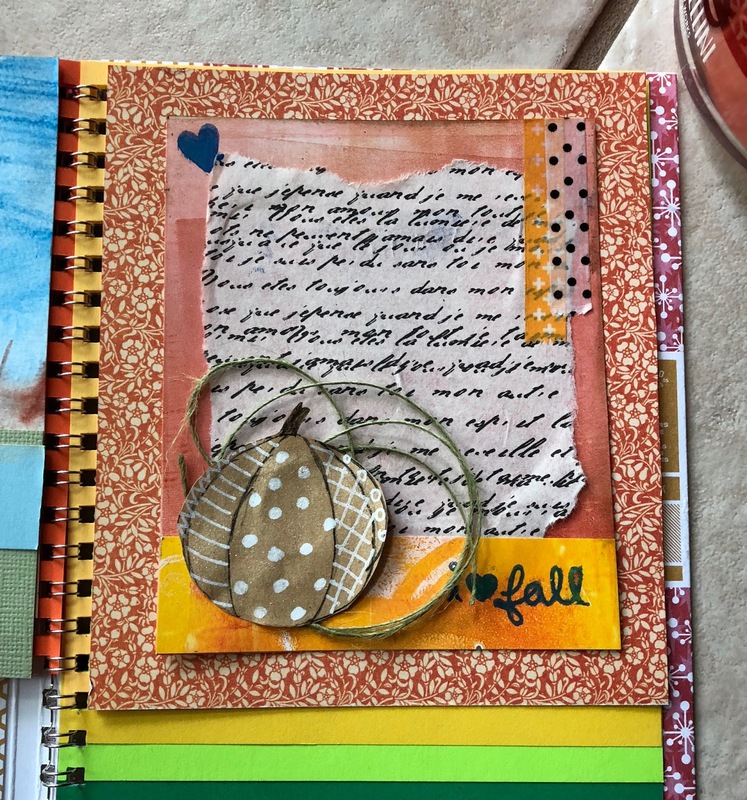 Falling Leaves Art Journal Page October 19, 2017, my sister-in-law gathered up some paper sample books she didn't need and gave them to the paper/crafty person in the family. I found one from a French paper manufacture that was pretty and decided to make an art journal with it. It was a very favorite project of mine and appartently you, too! The go to technique here is to make a motherboard so you have paper for backgrounds and elements ready to go. To find out more about motherboards click here. 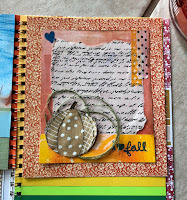 To read more about the Fallling Leaves Art Journal Page click here. 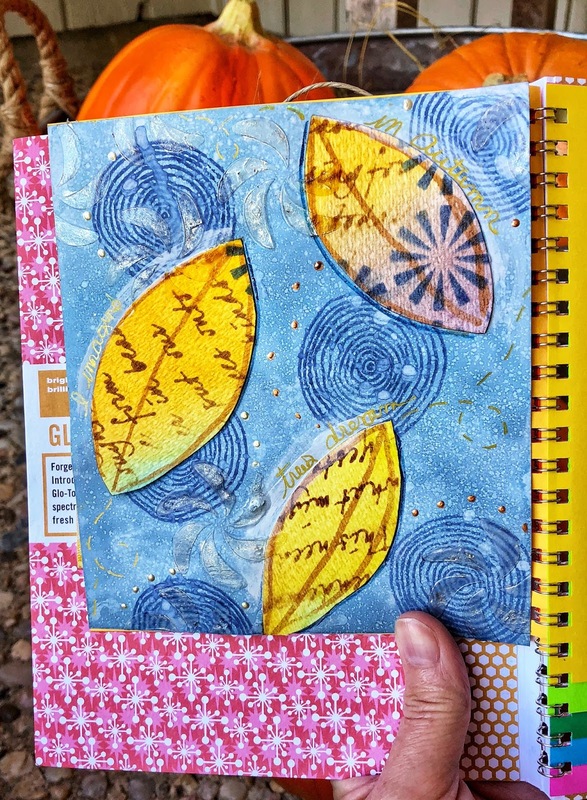 Autumn Art Journal October 12, 2017, the third post from my Autumn Art Journal project to make the top 5. Thank you. This project was so fun and a bit challenging to keep myself in the Autumn theme. I'm wondering if anyone would like me to include a similiar paper sample book in a give away. If you think this is something that you'd be interested in, please let me know in the comment section (it works!). There is a video to watch for those who are interested. It's all about the process--not the product June 29, 2017, I'm super excited that this is the number one post for the year because it contains my art journaling philosphy. I hope your journal helps you to experiment, explore and express yourself. Art journals are not necessarlily fininshed pieces to share with the world, but for your own self. I share mine because I think art journals are worth creating, and anything I do to help with that is valuable to me. Thank you very much for being with me in 2017. I wish you a very happy New Year with much joy and art. Wish to peek at my Etsy store? Click here.